Since the early 2000s, primarily research-based projects have focused on the use of new materials such as shape-memory alloys, light-emitting diodes (LED), film-encased photovoltaic cells and thermochromic paints. These materials offer a wide range of outstanding possibilities to the construction industry through their capacity to sense and respond to external environmental stimuli. Given the rich potential of these emerging materials and technologies for architecture, I was intrigued to know: what is necessary to introduce these materials in architecture? In this thesis, I report on design strategies that involve extrinsic and intrinsic material properties. 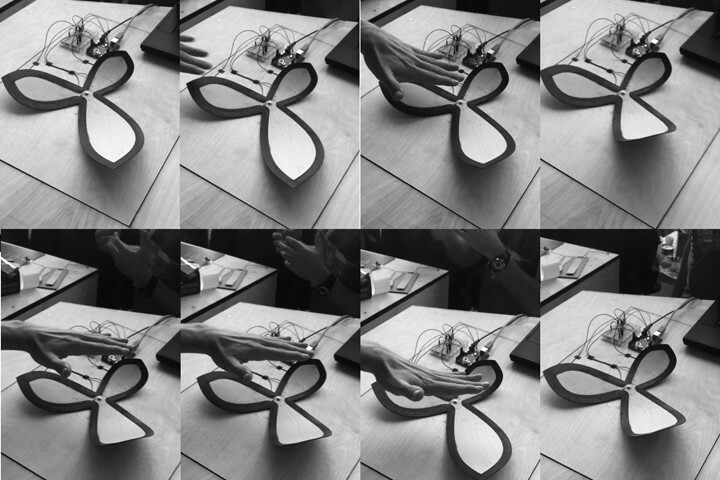 My research strategies included the use of digital design tools, physical computing and haptic-intuitive workflows in order to bypass a lengthy iterative design and analysis process through rapid intuitive feedback. My research demonstrates the necessity of both a digital and physical interaction with previously little- or un-used engineered advanced materials, if the use of those materials is to drive change in the overall material system. This proposition is developed and tested by practice-based research and design explorations. Centred on the idea of material-driven design processes, my research addresses the work of architects, engineers and materials scientists and locates opportunities for working together within a trans-disciplinary environment. Having direct interaction with materials and their behaviours generates an awareness of the material possibilities that enables architects to engage with engineers and materials scientists. In considering both theoretical and practical implications, my research contributes to the discussion of multifunctional materials as they emerge and their applications within architecture. The aim of the cluster titled Micro Synergetics focused on the topic of a collaborative design workflow for engaging with novel materials and their properties. A range of day-to-day materials were combined with shape-memory alloys, conductive inks and thermocromic colours to visualize micro changes if the inner structure of materials and their impact on the environment and vice versa. The outcome was an installation comprised of 8 working prototypes that displayed the synergy of material performance and social space. The Alte Oper lantern project was developed in collaboration with the Royal Melbourne Institute of Technology (RMIT) University and Bollinger+Grohmann Engineers in 2010. The installation utilized an improved phosphorescent long afterglow materials that have been developed by Prof. David Mainwaring and his team at RMIT. The material is a longer lasting phosphorescent blue and green pigment that can be incorporated into coatings and fibers. This material has the ability to last up to 2 days with minimal exposure to natural or artificial light and is currently being tested on building surfaces as a sustainable way to highlight areas. 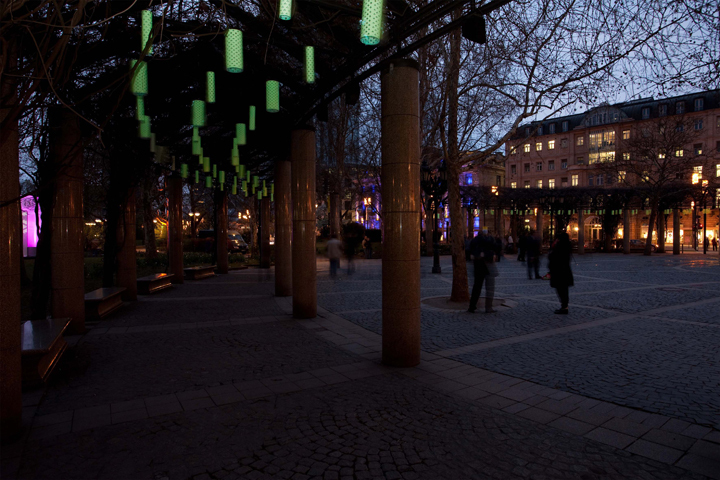 The lanterns were designed and analyzed by computational design tools and thought of as structures that will be the light source itself, passively illuminating the pergola structure in front of the Alte Oper, Frankfurt am Main, Germany. 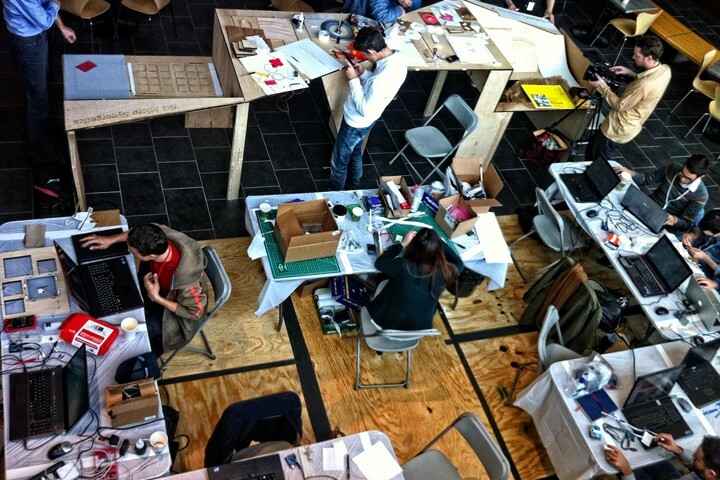 In the context of the 2011 Designing the Dynamic Workshop lead by Hugh Whithead and Jane Burry I co-supervised together with Daniel Davis and Chin Koi Khoo the cluster Material Behavior Group. The cluster was investigating new modes of representing and sensing the performance of sail patterns. The properties of textile materials to control the bending stiffness, stretch ability or torsion of composite materials. By designing different patterns of the structural yarn a lightweight and flexible system that could enhance architectural spaces was envisioned. 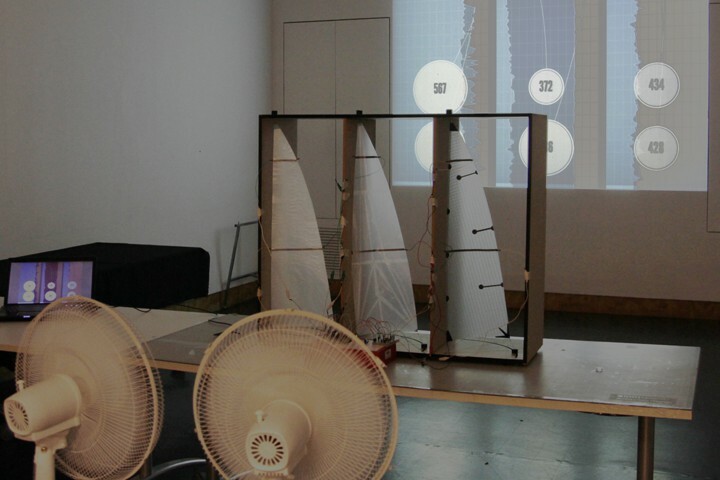 Materials such as Mylar© and different structural yarns were combined with self made sensors to visualize and represent specific geometrical configuration of the sail patterns. The image is displaying the principle diagram of the assembly of an “Augmented Composite” (ACs) . This type of composite is utilizing microcontrollers as a design tool for dynamic material systems which are material composites that combine the functions of actuation and sensing as designed objects. ACs are assembled material composites based on smart materials that may incorporate additional materials as substrates. They can be controlled via digital media and are part of a digital and physical design process to encounter the possibilities of dynamic material systems. Bohnenberger, S. (2013), “Material exploration and engagement: Strategies for investigating how multifunctional materials can be used as design drivers in architecture”, Ph.D. doctoral Thesis, Architecture and Design, RMIT University.